The concept of a dual-modality positron emission tomography and computed tomography (PET/ CT) scanner was first proposed in 1994 by physicist David W. Townsend, PhD, and engineer Ronald Nutt, PhD, while working at the University of Geneva in Switzerland. The goal was to provide an integrated imaging system that would produce accurately aligned, clinical-quality PET and CT scans. With funding from the National Cancer Institute, the prototype PET/CT scanner was built and, in 1998, it was donated to the University of Pittsburgh for testing. In October 2000, the United States Food and Drug Administration approved PET/CT for use as a diagnostic and therapeutic tool for cancer treatment, and commercial shipment of PET/CT systems began. Now that many physicians have gained extensive experience with this technology and are reaching the top of the learning curve on its basic use, they would like to increase its usefulness and to improve the reading experience. "This is something that I and other physicians who have been using the PET/CT have been discussing," said Jacqueline Brunetti, MD, Director of Radiology, Holy Name Hospital, Teaneck, NJ. "With PET/CT, we have high resolution and we have high accuracy. We have scans that give us very good specificity. But the bottom line is that we need a way to deal with all that data. Up front we have a superb tool to identify cancers and to stage patients, but the issue is the ability to track these lesions and to monitor changes. We need to be able to look at the data in a meaningful way. We need speed, and we need more functionality to perform measurements and to deal with the volume of images and data that we have." At the 54 th Annual Meeting of the Society of Nuclear Medicine (SNM), June 2-6, in Washington, DC, GE Healthcare (Waukesha, WI) will introduce new software that is designed to address these issues. The PET VCAR (Volume Computer-Assisted Reading) software works on the GE Advantage Windows (AW) Workstation. PET VCAR has undergone testing at 3 preclinical sites and 7 clinical evaluation sites. GE expects to be in full production by the end of 2007. 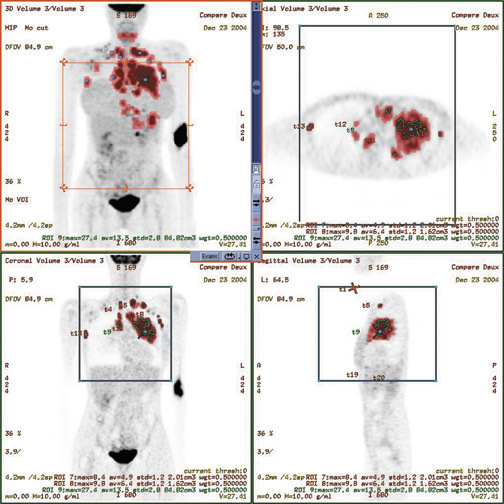 The software automatically highlights and bookmarks regions of metabolic activity in the PET component of the PET/ CT image and provides measurements of standard uptake value (SUV) and volume of the metabolic activity (Figure 1). The software, which was designed to monitor disease progression or response to treatment using multiexam comparison, bookmarks these locations using the CT data and provides anatomic tracking and automatic registration when multiple studies of a single patient are opened. "PET VCAR has been cleared for use by oncology clinicians to help with the diagnosis, staging, treatment planning, and management of treatment response," explained Kelly Piacsek, PhD, Global Oncology Product Manager, GE Healthcare. "The goal of PET VCAR is to provide an analytic environment so that the user can track critical parameters in evaluating tumor response to various therapies. The software provides an identification of high metabolic areas and performs automatic segmentation of those areas," she continued (Figure 2). "It provides information such as SUV maps, SUV mean, and what we call a 'functional volume,' which defines the total number of voxels appropriate for a particular tumor. It then coordinates that information over time, so you can have a baseline scan and an unlimited number of follow-up exams that you can track and report percent change of those critical parameters." "The functional volume information is a result of 3 different built-in segmentation algorithms," Piacsek added. "Additional user preferences can be set depending on what the user desires, the acquisition parameters, and the ideal settings for a particular patient." Once the data is acquired and analyzed by the software, the results are complied and presented in the Interactive Data Analysis (IDA) spreadsheet. The IDA organizes the information in an interactive format that is synchronized with the image display. The user can click on information in the spreadsheet to be directed to the corresponding spot on the image. "The results are given in a tabular format," explained Piacsek. "Our patented data presentation, IDA, allows the user to click in the table and triangulate to various tumors in the image volume set. Then the parameters in the table can be exported into separate files that are supported in Excel." The final reports can then be stored and accessed on the facility's picture archiving and communication system (PACS) or on compact disks (CDs)." "The program has a portable CD reporting tool that can be used on any PC, or it can be moved to a PACS, where you actually collect preferred images and analytical information, along with the report-critical images," said Piacsek. Brunetti commented, "One of the things that I think is very important is that the graphs, trends, and all of the data must be translatable onto the PACS. It also must have a method of recording data so that the report can be sent to the referring physicians. The referring physician needs to have a measure of what he or she is doing and whether or not it is effective. Medical oncologists, particularly, want to know what changes are occurring, if the current treatment is effective, if there is new disease, and so on. I think this will give them a depiction in the form of a graph of trends and changes in the patient's malignancy. I think this will help them in utilizing the PET/CT." "Once the tumor delineation and baseline exam are completed, bringing in future studies is very easy," explained Piacsek. "The software has autoregistration that happens immediately when multiple exams are opened and has automatic bookmark propagation. With a single button click, the user can propagate all the original tumor bookmark information to the new image data set. It is very efficient management of data from multiple time points." "I think one of the most powerful pieces of the VCAR is the ability to track, to have a more objective way of looking at what's happening, and of trending changes," added Brunetti. "As people are more involved in PET/CT, you get patients who are coming back for their fifth or sixth PET/CT exam--or sometimes for even more of them. How do you deal with all this data? It's so important to be able to look at not just a point in time but a larger time frame. Most radiologists will not just look at the last CT in their cancer patients, but they tend to pull up the prior exams as well because it gives them a better idea of what's happening to the patient." Piacsek sees particular value in this software for patients with metastatic disease. "The system's workflow and detection capabilities will be extremely useful for tracking a large number of lesions over time," she noted. "Also for patients who have cancer in remission who are having annual follow-ups; this is a product that will allow you to bring in all your previous information and look very quickly to see if there is anything new." "Certainly, for the patient themselves, I think it gives another level of confidence and maybe another level of comfort," added Brunetti. "We have an additional piece of solid information that can be translated into their reports to give another level of information as to how their therapy is progressing." "PET VCAR allows us to look at trends in an organized fashion," said Brunetti. "It gives us the ability to graph changes so that we can pictorially look at trends, which I think can be very helpful in monitoring patients," said Brunetti. "Going forward, I think some studies should be conducted to determine exactly what we are viewing and to identify the meaning of these changes." "I think the obvious next step is to bring in more of the quantitative CT tools to add to this as well as some of the radiation oncology capabilities," added Piacsek. "We already have built in the ability to export a radiotherapy (RT) structure set for RT planning, but I believe the next step is to bring in more of these pieces, including respiratory gating and full simulation capability." 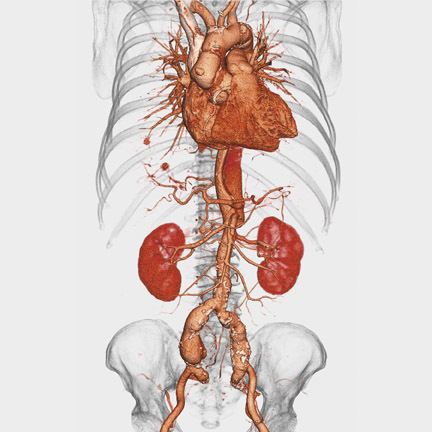 "You need the functionality of the PET/CT workstation to be as powerful as the front end with the high resolution and the exquisite anatomic detail," concluded Brunetti. "What do we do with all that information? I think the PET VCAR addresses this in a very efficient and quick manner, and it provides a comprehensive way to tabulate and trend some of the information that we obtain on the PET/CT." 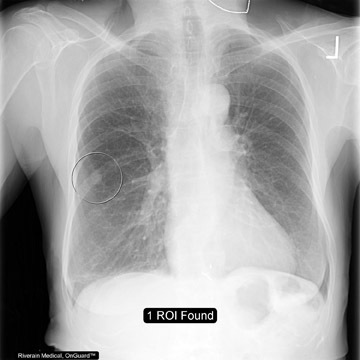 Technology and Industry: Volume Computer-Assisted Reading for PET/CT. Appl Radiol.